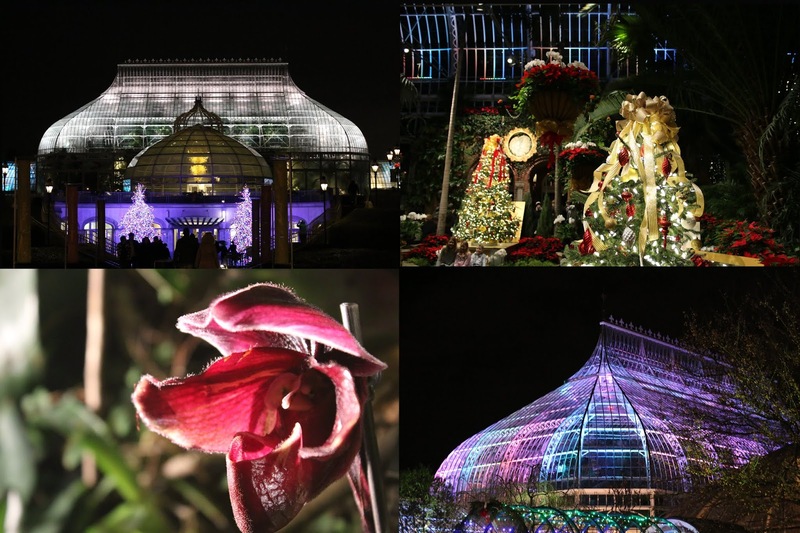 There is nothing else quite like exploring the botanical gardens of Pittsburgh's Phipps Conservatory during the holiday season. This 125 year old Pittsburgh institution is always beautiful, but especially when it is decked out for the holidays. From the Christmas trees, to the lights, decorations, model railroad, and more, Phipps is filled with pure magic during the holidays. Due to the popularity of their holiday event, you now have to reserve a time slot for entry into the gardens so the crowds are evenly dispersed at peak times. This system was successfully integrated a number of years ago at eastern PA's stunning Longwood Gardens. We showed up early in order to grab a bite to eat at the delicious Cafe Phipps. I had the amazing Chicken Moambe Congo Stew, and Brit had the Pulled Pork Sliders. From the delicious foods, to the great drinks, including coffee, spiked coffee, fruit spritzers, and more, the food offerings at the Cafe are fantastic. We took our time and had a great meal while we waited for our scheduled time. The Palm Court was recently restored closer to its original style, with the addition of stunning LED lighting into the new window panes. Ornamentation and architectural details that were lost over the years were restored, and the results look incredible. The glass is crystal clear again, and the building is even more stunning to see at night from the outside. For more details on the project, check out this article. Aside from the stunning flora, Phipps is a destination for its collection of world class glass sculptures. Works from Chihuly, Fräbel, and Gamrath adorn the gardens. Shown here is Paint Brushes, by Chihuly. There is something even more remarkable than usual about the way they decorated the trees this year. Adornments include the use of live amaryllis, succulents, bird feathers, and more. The trees marking the way to this year's giant tree in the Victoria Room. An entire Christmas Tree made of succulents. Along with another made entirely of poinsettias. The anthropomorphized displays of animals throughout the museum were really cute. This common theme throughout this year's display felt like Dogs Playing Poker coming to life in the form of penguins, rabbits, squirrels, bears, and more. The Garden Railroad looks especially great this year, with it celebrating scenes from the surrounding Schenley Park over the 125 years of Phipps Conservatory. Now checking out the holiday lighting of the outdoor gardens. The newly restored Palm Court looks incredible from the outside. The modern styling of their lights really provides a festive and non-traditional look to their displays. It really makes these displays a must-see for anyone who loves holiday displays. I could watch the lighting of the Palm Court cycle for hours. Notice the ornate decoration at the top of the roof. That decoration is referred to as the Ogee Crest, which was restored in the recent renovation after the original was torn off during a storm in 1937. The room was impressive before this renovation, but now it is nothing less than stunning and a fine example of an elegant greenhouse from the Victorian Era. Phipps is a wonderland of light during the holidays. Our favorite room in the conservatory is the Sarris Orchid Room. This room looks radically different depending upon the time of day that you visit. Certain aspects of the orchids are accentuated with daylight, and other aspects are highlighted with evening lighting. We highly recommend seeing them during the day and at night. More of those anthropomorphized animals! Some squirrels sitting down for tea and a pack of bears just hanging out. A gingerbread house, with fresh fruit subbed in for candies. Overall, the 2018 edition of the Winter Flower Show at Phipps Conservatory is absolutely phenomenal. It runs through January 6th. Reservation times will be needed through January 6th and you can get them through this link. Linn Run State Park. 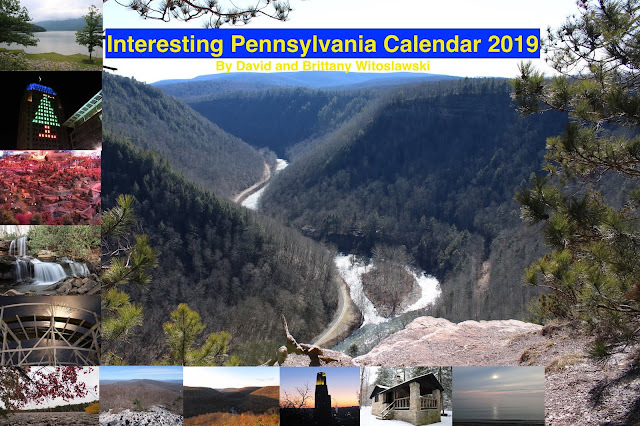 While it is nowhere near the biggest, nor does it have a ton of attractions compared to a park like McConnell's Mill, Presque Isle, Ricketts Glen, or Ohiopyle, Linn Run is one of my absolute favorite state parks in the state. There is something about that feeling when you get down in the Linn Run Valley and feel the temperature get much cooler. There is something about the sound of the roaring mountain creek that is Linn Run. 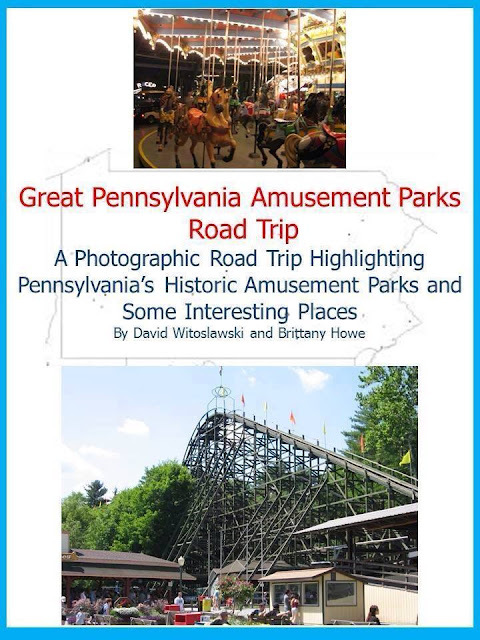 The valley is filled with the state flower, Mountain Laurel, in addition to our state tree, the Hemlock, along with pines and many hardwood species of trees. All of it put together, makes this place really stick out to me. This place is so serene and lovely. It clears my mind of everything and I can just relax. Something kicks in when I get here to just slow down and take in what is stimulating my senses. Linn Run State Park is an inspiring place to me. As I look back, Linn Run State Park was one of the first places that we wrote an article about. On that visit, we spent the weekend in one of the beautiful CCC built cabins and warmed ourselves up with the fireplace in the cabin. It was an awesome time and it really inspired me to continue the exploration with our page. It is hard to believe that just over a century ago this land was a wasteland and heavily logged. This, and the rest of Forbes State Forest, were completely logged around the turn of the century and sparks from the steam locomotives would catch on the discarded branches, causing terrible fires. With a vision for the future, the state purchased the land and grew a second growth forest that is spectacular. Linn Run State Park is the jewel of that effort in this region, in my humble opinion. The start of the hike to the falls. This is a very short hike, but there is a loop trail that gives you a nice hike through the woodlands. There are a number of nice hikes along Linn Run, including these, and the Flat Rock Trail. Additionally, just outside the state park in Forbes State Forest, there are several fantastic hikes that lead to the Wolf Rocks and Beam Rocks Overlooks, which are some of the finest overlooks in the state. Once you hit this bridge, the falls are on the right. The view from the top of the falls. The falls can't be any taller than 20 feet, but they are pretty. Linn Run is one of my favorite state parks in the state. You definitely should check it out sometime if you like to escape to the outdoors.